Also, what skins would YOU guys like to see? Personally I want Bruce Swain to be made.. and beach party Oriana. I want some sort of fire phoenix Anivia, or different elemental versions of her, because the lore does say there are different elemental phoenixes. This was a rather good skin someone came up with. I'd totally support this one getting made. I want Reverse Gragas. A barrel with legs that rolls exploding fat guys. 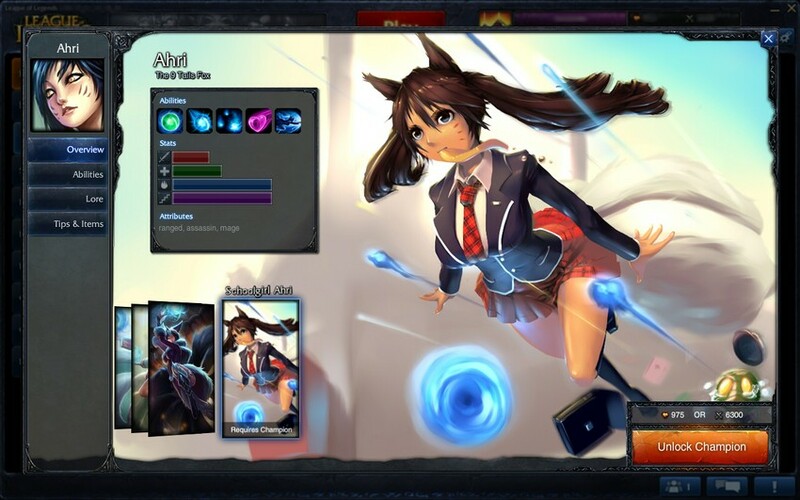 What the hell is in that Ahri's mouth? Fried tofu. I usually associate toast in the mouth with the whole Japanese schoolgirl thing, but apparently, it's some kind of play on the fact she's a fox. Beach Party Sejuani and Ashe for the irony, heh. Just putting it out there I want one of the chicks (I'm guessing the best one would be Riven) to have a scythe as a skin. No offense bu6t that skin looks horrible. I don't exactly care for custom skins though, and this one definitely doesn't win me over in any way. One does not simply LoL because of a custom skin.